Our second guest post today, this one from Nick Poole, CEO of CILIP: Thanks to the skills and dedication of their staff, libraries across the UK deliver effective low-cost services and innovative ideas every day which help their communities address some of their biggest challenges. The national Libraries Change Lives Award has sought to recognise this body of work and extract powerful stories of lives and communities changed for the better. We look at some of these initiatives which demonstrate how public libraries support four main public agendas and act as key agents for positive change in their communities. An estimated 11 million people in the UK lack digital skills or online access*, and with it lose out in terms of employment, education, social inclusion and access to public services. *[note from editor: there are numerous sources for evidence on levels of digital inclusion. ONS data for Q1 2015 showed that 11% of the population had never used the internet, and the total estimated figure of 12.6 million is quoted in the recent GoOn UK report] In homes and schools, balancing e-safety with the opportunities offered by technology and the internet are complicated by a widespread lack of awareness nationally around safely managing children’s online access. Developed as an early intervention against poverty and low attainment in the North Ayrshire region which has Scotland’s highest level of youth unemployment, ‘Appiness’ is a digital learning and e-safety programme which offers pre-school children online learning in a range of areas including literacy, numeracy, art, music, science and technology. Parents also take part, gaining crucial guidance about online safety controls and an understanding of how to put information technologies to use in support of their child’s educational development. 200 children in the region and over 250 adults have developed essential digital literacy and gained valuable online skills, with local primary schools valuing the boost to children’s formal education on starting school. There is a very strong business and employment information and support offer across UK libraries, with seven dedicated Network Business & IP Centres nationally and a further ten satellite projects generating £38 million in added value to the economy - a payback of £4.50 for every £1 of public money spent, rising to £25 in 2018. One of the above satellites, Northamptonshire Libraries ‘Enterprise Hubs’ initiative is a partnership with the Local Enterprise Partnership to encourage library users to use their skills to turn themselves into self-employed entrepreneurs, many of them would-be job-seekers who cannot find opportunities in the local job market. Since launching in 2012 the service has helped form businesses trading in areas ranging from cleaning services to boat-building and veterinary lab services –accounting for about 10% of all the county’s start-ups and creating a chain of economic prosperity, business innovation and employment. Leeds Libraries work with a local media production partner to deliver training, accredited qualifications and the start of a career in the creative industries to library users, many coming from local BME communities and who were excluded from school, experienced poor formal education or have been long-term unemployed. Public libraries provide a range of savings to the public purse on areas including education, social care and health, and are estimated to save the NHS at least £27.5 million annually according to the Arts Council. Portsmouth City libraries offer dedicated services and facilities to support an increasing number of the city’s population who have or are facing visual impairment to lead independent, productive lives and have formed a strong links into the community to ensure the needs of visually impaired adults are taken into account in the planning and delivery of local services. Kirklees are one of many library services working with hospitals, healthcare professionals and community organisations to offer bibliotherapy services and the Books on Prescription scheme, inspiring and engaging with those who may be difficult to reach due to mental ill health and suffering from depression, bipolar disorder, psychoses like schizophrenia, dementia and drug and alcohol addiction. Local populations in Kent and Norfolk can benefit from dementia friendly services, support and information designed to help individuals living with dementia and their families and carers. Public libraries are a key resource and a safe place for vulnerable groups and those at a social disadvantage. Libraries have long offered support services for refugees and many staff and services are gearing up to welcome and support refugees coming to the UK over the coming months. St.Helens libraries’ Cultural Hubs programme is successfully targeting those accessing adult social care and those at risk in this area, supporting the Council agenda of improving wellbeing across the population in what is one of the UK’s most economically deprived regions. 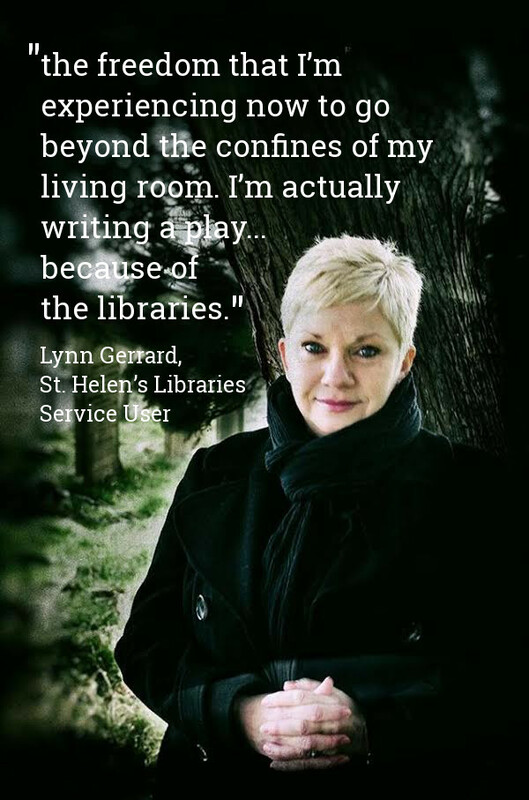 This programme of creative arts across St.Helens 13 libraries support local wellbeing and tackles mental and physical health issues via activities such as workshops, classes, dances, plays, gigs, events and exhibitions. User stories include a recovering alcoholic and a woman getting her life back on track and writing a book despite agoraphobia. Working with frontline domestic abuse professionals Surrey Library’s Domestic Abuse programme provides vital information and resources in a safe environment to those experiencing or surviving domestic abuse, including sexual, emotional, physical, forced marriage and genital mutilation. The offer also enhances awareness of the issue among Council staff in the county. Drawing together the USPs of staff expertise, the wide resources of the library and the trust of users and a wide range of delivery partners, public libraries are critical for the creation of productive, healthy communities and a vital delivery channel for local and national government agendas. Another secondee comes on board!